The Japanese have taken another step toward making eerily human-like androids by creating one with a neural network that breathes life into the robot’s facial muscles, making them react to outside stimuli with the aid of a central pattern generator. The robot, named Alter, will be freaking visitors out at the National Science Museum in Tokyo soon, in an exhibit lasting a week. The CPG’s neural network replicates neuron activity, allowing the android to mimic human movement patterns by way of its sensors, which respond to temperature, proximity and humidity. While there’s still work to be done to make the thing more humanlike, Engadget says you get peculiar feeling the robot is alive when facing it directly and observing the face at work. 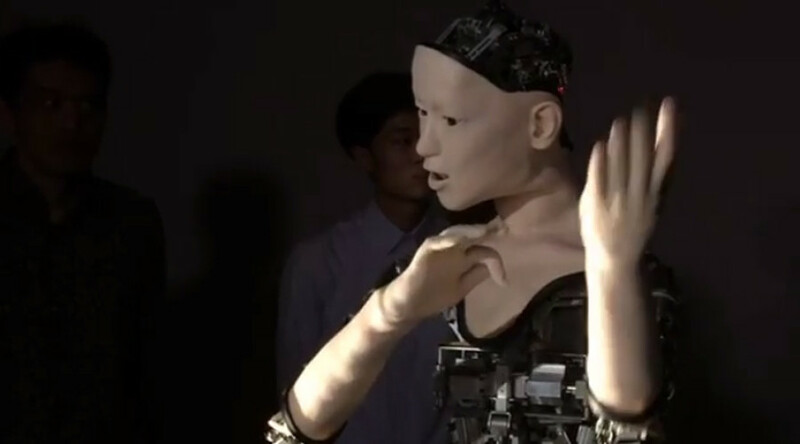 The point of the project was not to move closer to mimicking humans, but to enable robots to ‘control’ their movements and twitches on their own. Researchers from Tokyo University and Osaka University are referring to this human looseness as “chaos”. And it’s not just about Alter’s face: his head and arms will also respond to the stimuli. The machine will have a switch offering the opportunity to switch from more conventional ones to “chaos” mode. But it won’t be up to the human to activate it. Alter will decide for itself when to don the human mask when its sensors react to environmental readings. The researchers tried to attach particular movements to particular situations and circumstances that might produce the movement in the world of human interaction. Alter can already sing, but at the moment, the robot tends to freak people out with its sine-wave melody. Researchers are working on new models, presumably with better sound chips. The most interesting part about Alter remains the CPG, as it mimics how the neural network behaves in a sort of “spike and burst behavior”, as the Japanese scientists refer to it. This means that when a stimulus creates a signal spike in the neuron, it creates a chain reaction with other neurons. This is something Professor Ikeue calls “coupled pendulums” – due to the way the chain reaction takes place in a rhythmical fashion, although Alter’s movements are anything but that, resembling rather his own signature type of movement. Japan’s love affair with androids has produced a wealth of ideas that have firmly placed the country at the top of robotic innovations. The country is due to have its own robot Olympics in just a few years, following Prime Minister Shinzo Abe’s countrywide vision for the future.